Puglia is a destination that should be on the radar for all Italy lovers and this holiday combines a discovery of its superb cuisine and wines with easy rambles among gently rolling landscapes. Explore the ancient sassi quarter and gorge of Matera, visit the conical trulli houses of the Itria Valley and see how local cheeses, bread, olive oil and wines are produced. After joining the trip at Bari airport, we drive to Altamura, a pretty town located on Puglia's sparsely populated limestone Murge plateau. Tonight our journey of culinary discovery commences with an included dinner of regional dishes. Our husband and wife hosts, Nina and Peppino, serve us up a feast of their home-grown vegetables and other locally sourced produce in an amazing array of traditional Puglian antipasti appetisers. Altamura is famous for being the only town in Italy with a DOP (standing for 'protected designation of origin') recognised bread. The bread has a hard crust and creamy coloured dough and usually comes in very large round loaves. We start the morning with a 20 minute walk to visit a well known Altamura DOP bakery where we watch the art of making and baking the bread in huge wood-fired ovens. Naturally our visit includes the chance to taste the freshly made bread! The afternoon is left free to spend your own time exploring more of the narrow alleyways and closed courtyards of unspoilt Altamura. Alternatively, you may like to take the local train to the nearby town of Gravina which has a fascinating underground city of rock cut caverns, churches and passages. This morning we take a short drive to Nina and Peppino's vegetable garden to see how they cultivate the vegetables served at their table, learn about the local varieties and help harvest them. We then go to their restaurant, the Tre Arch, for a hands-on cooking lesson where we learn to prepare the distinct Puglian pasta known as orecchiette - meaning little ears - as well as learning the tricks of how to prepare oven-baked vegetables, one of the specialities of the house. For lunch we will eat what we have prepared during the cooking class. In the afternoon we drive out of the town to the Alta Murgia National Park where we start our walk from the Pulo di Altamura, a giant sink hole, some 500 metres wide and 80 metres deep and one of the park's most impressive geological features. The steep rock face is embedded with caves that have been inhabited since prehistoric times and are an important nesting ground for rare birds and habitat for native flowers and other plants. We walk through a landscape of cultivated fields and wild grasslands along footpaths and cart tracks, passing old abandoned farms. The walk ends at the Lamalunga archeological museum where we learn about the life and fate of 'Altamura man', a Neanderthal who fell down a sinkhole around 150000 years ago and whose bones became fused with the stalactites in the cave walls. Today's eight kilometre walk, an ascent of 30 metres and descent of 90 metres, is expected to take around two hours. This morning's walk is in the environs of the Castel del Monte, about an hour drive from Altramura, standing on a hill on the edge of the Alta Murgia National Park. The 13th century citadel is a UNESCO World Heritage Site and was the source of inspiration for the novel 'The name of the Rose'. Around the castle, fine wines are produced of the 'uva di Troia' (Troy) grape variety. We start with a climb towards the castle through a shady forest, descend the other side and continue through fields lined with dry stone walls and dotted with small ancient trulli (the white, conical-roofed, beehive-shaped structures that are typical of this part of Puglia). In this sparsely populated region the vast open views are spectacular. Our walk ends at a local organic farm, Masseria Sei Carri where we enjoy an included lunch of local produce. After lunch we drive back to Castel del Monte for a guided visit before continuing on to our next destination, the town of Matera, over the provincial border in Basilicata. The town is impressively located on the side of a gorge eroded by the Gravina River and is famous for its ancient 'Sassi', a UNESCO-listed troglodyte quarter whose origins date back to the prehistoric era. In the 1950s the government of Italy forcibly relocated most of the population of the Sassi which it considered a slum. Today the quarter is regenerating with hotels and other businesses moving in. Today's eight kilometre walk, an ascent and descent of 250 metres is expected to take around two-and-a-half to three hours. Today we plan to set off direct from the town, on a walk through the deep gorge that cuts through the plain just outside the town. The walk also takes us to see some ancient rock churches. There is also plenty of time to explore the labyrinth of Matera's narrow streets. You can visit the neighbourhood of the Sassi where the stone dwellings are partially cut deep into the rock. This part of Matera has been continuously inhabited for 5000 years. Your Leader can arrange a guided tour with a licensed guide for those interested. Roaming through the maze of narrow alleys, up and down the stone stairs you will find yourself transported to a distant past. Sit down on a terrace of one of the bars for a cappuccino and soak up this magical atmosphere. Today's eight kilometre walk, an ascent and descent of 280 metres is expected to take around three hours. This morning we leave Matera and drive to visit an organic cheese maker who has won several national and international prizes. We will see how mozzarella, trecce and nodini are made and try the freshly made cheeses. We then continue on to Cisternino, a charming town of whitewashed houses, shady streets, historic churches and elegant piazzas. It is famous for its butcher shops which serve a local barbecued delicacy known as bombette, little meat parcels filled with mince, ham and cheese, as well as other grills. We enjoy a walking tour here and buying lunch from one of the butchers is highly recommended. After lunch we visit an olive oil mill that produces oil using both a traditional and a modern press. We tour the mill and walk in the surrounding fields to see the ancient olive trees, followed by a tasting of the oils produced here. We then drive on to our final destination of the holiday, the town of Alberobello in the Itria Valley - famous for its iconic trulli buildings. A trullo (plural - trulli) is a traditional dry stone hut with a conical roof and often whitewashed walls, which were generally constructed in the 19th century as both dwellings and storehouses. Trullo are built singly or in groups of up to 5 trulli, and a group would be occupied by a single family. Inside an individual trullo dome is just one room, although additional separate spaces were created by curtains hung across arched alcoves. 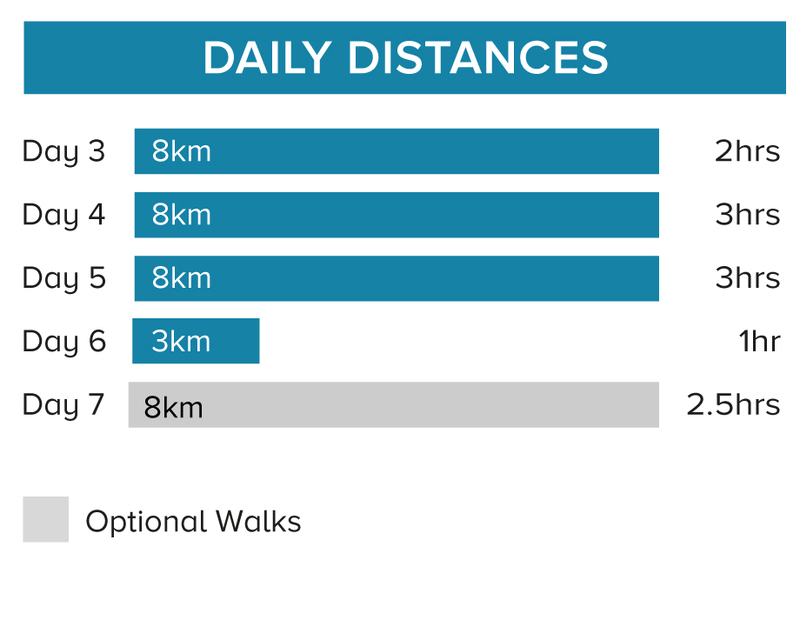 Today's three kilometre walk is fairly flat and is expected to take around an hour. This morning we take a stroll around the trulli-lined streets of Alberobello before we pay a visit to the Cantina Albea and the wine museum for a tasting of local Puglian wines, both still and sparkling. In the afternoon you can choose to explore Alberobello further or the trip leader can organise a visit to the seaside fishing town of Monopoli for an authentic taste of Puglian coastal life. Monopoli's whitewashed buildings huddle around a small harbour and it is well-known for its excellent seafood restaurants. In the morning we will walk around two-and-a-half kilometres. Today we drive to Bari airport where the trip ends. You will need light layers of clothing for walking during the day and a fleece and waterproof jacket for early mornings and evenings, and early/late season. A sunhat is essential. Take one main piece of luggage and a daypack. You should bring a 2 litre water bottle, sunhat, sunglasses and sunscreen. Trekking poles may also be useful. At your discretion you might consider tipping your Explore Leader in appreciation of the efficiency and service you receive. We walk on 5 days with walks between 1 and 3 hours. The Puglian countryside is gently undulating. Trails are generally good - the gorge walk at Matera is rocky underfoot and trekking poles can be helpful. We have graded the walking on this trip as Easy. Want to find out more about Puglia's amazing cusine? Read the blog by our PR Manager Laura Dewar.